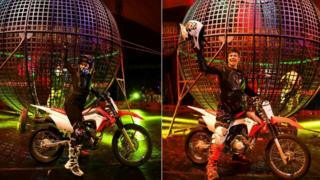 Three stunt motorbikes have been stolen from a circus, Merseyside Police said. The adapted bikes were taken from Gandeys, currently based at Aintree Racecourse, by thieves who broke through a fence on Wednesday night. The motorbikes are used to race around the circus's metal "thunder dome" during the show's finale. A £500 reward has been offered for any information which leads to the conviction of the thieves and the return of the motorbikes. Merseyside Police confirmed they had received a report of three 125cc Crosser bikes - two red Hondas and a green-and-white Kuba - being stolen. The bikes, which are "impossible to replace easily", have odd-sized wheels and are "not for road use", the circus warned. They are raced at speeds of more than 35mph, "exerting the same G force as a fighter jet", by the Gerling family from Colombia, said a spokesman. Gandeys Circus is performing at Aintree Racecourse until 3 March.